What a team, John Kerry and Barack Obama. The pit of hell must be proud. -W.E. I am deeply appalled at the actions of our government, Barack Obama and especially John Kerry. Mortified is probably more descriptive of my feelings, that and an absolute sickening revulsion at what is being done in the name of so-called “Democracy.” If you were not already aware of it, Obama has appointed Senator John Kerry as the Chairman of the Senate Foreign Relations Committee. That’s right, Mr. Swiftboat himself is now doing internationally what he did in the US. Local treason just wasn’t enough – no, he went global. And Kerry has already signaled that the US will deal with the new Islamic leader of Egypt with no bias or preconceptions. Well, how very dhimmi of him, groveling on his knees to the Islamic fascists helping to usher in a new worldwide Caliphate. Knowing Kerry, it is right in character and totally expected. Obama and Kerry have innocent blood all over their hands already with the recent murders of Copts and other Christians in Egypt. You see, they don’t give a damn about the people… This is about power and control and the US is actively aligning itself with the Muslim Brotherhood under the Obama Administration. 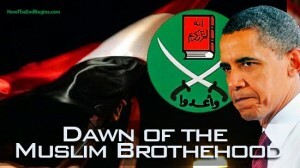 Our leaders have met with CAIR and the Muslim Brotherhood hundreds of times in the White House during this Presidency. Do the math.